. . . a copy of her likeness, transferred from an oil painting which has been kindly lent by its present possessor. This portrait was owned by Madame Flower at the time of her lamented deatlh in 1865, and was by her presented to the medical man - the late Dr. Duigan - who, out of friendship and pure goodness of heart, attended her in her last sad illness. The painting had been greatly damaged and cut about with a knife: in a drunken freak by the poor lady's husband. Dr. Duigan caused the picture to be repaired as far as was possible, and kept it till his death, when it passed into the hands of the late Mrs. J. B. Virdau, another old friend of Sara Flower's, and mother of the lady Mrs. Fremiln, from whom we have obtained it . . .
. . . Her personal appearance was well adapted to set her off to advantage in character parts. She had a beautiful figure, limbs, and bust, and although her face was homely it became illumined as she entered into the spirit of her personation. Off the stage her hair was sand-coloured, without a trace of gold in it, and she had a colourless complexion . . .
Sara Flower arrived with John Dunmore Lang's immigrant shipment, on the Clifton, first in Melbourne, on 13 February 1850, intending to sail on with the ship to Sydney. On the layover, she appeared "positively for this night only" in Thomas Reed's Melbourne concerts on 28 February 1850, when her solo numbers were Schubert's The wanderer ("as sung by Miss Flower at the London Concerts"), Benedict's By the sad sea waves, and Crouch's balled Dermot Astore. The ship's departure being delayed, however, she appeared several more times for Reed in Melbourne and Geelong, finally missing the Clifton's voyage and being afforded a Melbourne farewell at the Queen's Theatre on 26 March, before sailing out on the Asia on 6 April. Note that, as at November 2012, the Wikipedia article on Sara Flower appears to be closely based on material from Ann Beedell's illuminating (but sadly not easily accessible) doctoral thesis, by far the best and fullest study to date of Flower's life, voice, and career. This accomplished pianiste gave a Concert, a large scale, on Wednesday evening, at the Hanover-square Rooms, calling into requisition a full band and chorus . . . solo players were . . . Mr. Key, in the octave flute obligato to Handel's Hush! ye pretty warbling choir," sung by Miss Lockey, who, by the way, was encored in Benedict's "By the sad sea waves." Miss Sarah Flower sang, for the first time in London since her return from Italy, and was much applauded in Cherubini's "O salutaris hostia." She has noble contralto, and is improved in style. ... Miss Flower, as a contralto, is the first singer we have, the clear, rich, beautiful quality of voice, the soft blending of her tones, and the execution, form altogether a specimen of the singing art, we have not had for a long time; indeed, we may be proud of her as the first vocalist of the day in her peculiar style. Miss SARAH FLOWER, From the Princess' Theatre, London. Mr. REED begs to repeat that this will be the only occasion on which the public of Melbourne will have an opportunity of enjoying the performances of this talented artiste. All the other available talent in Melbourne will be secured for the ocension, and every execuation be used to render the performance worthy [of] public patronage. Full particulars will be given in a future advertisement. Without any wish to "puff" off the abilities of Miss Sara Flower, who "stars" it at Mr. Reed's concert to-morrow evening, it is but justice to mention that this lady is a thorough musician, and possesses a beautiful contralto voice of great register and flexibility. She first became a public favourite by undertaking, at a few hours notice, the leading score in an opera, a duty that devolved upon her in consequence of the sudden indisposition of the prima donna. Miss Flower, (a passenger per Clifton), proceeds to Sydney with the vessel, and we, therefore, recommend our musical friends, who desire to hear a really leading singer, one possessing all the natural and acquired requisites that constitute a first-rate vocalist to attend the Mechanics' Institute to-morrow evening. Miss Flower does not, we hear, purpose practising her profession in Sydney, whither she proceeds to join her brother. MADAME Sara Flower, a vocalist well known in England, died in Sydney on the 20th ultimo. 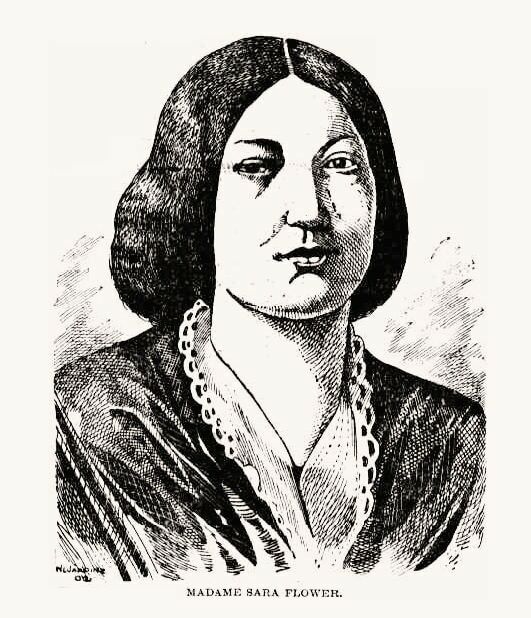 The late contralto arrived in Melbourne in the early part of March 1850 and sang at two concerts given in that city - her reputation as a vocalist of the highest order suffered no diminution when she first appeared in Australia. Madame (then Miss) Sara Flower left Melbourne in the ship Asia, and arrived in Sydney on the 15th April 1850, and sang for the first time in this city on the 3rd May, in the same year, at a grand concert given by Messrs. S. and H. Marsh at the Victoria Theatre. The tones of her rich and highly cultivated voice acted like a spell on the audience - very few of whom had probably heard the only other great contralto in the world, Madame Alboni, her amazing compass from E flat in contralto to the higher range of the mezzo soprano, astonished and delighted all her hearers. Her debut on that occasion was thus noticed in the Sydney Morning Herald of the 8th May. "It is the opinion of the musical public of Sydney, both professional and amateur, that Miss Sara Flower is beyond any comparison the most gifted and accomplished vocalist that has ever visited Australia." The cavatina "Nume che intence" which was selected for Miss Sara Flower's first appearance before a Sydney audience, afforded a fine opportunity for the display of that lady's quality and power of voice; also of the judgment, taste, and excellent enunciation of the artiste, and rapturous applause burst forth at its conclusion. Miss Flower's taste and purity of style in simple ballad was manifest in "By the Sod Sea Waves" which with the "Wanderer", and "Swiss Girl" elicited such tones that must have "astonished the natives". When Bellini's Norma was first produced in Sydney, Madame Sara Flower sustained the character, and though the music was not written in her register of voice, her great skill as a musician overcame difficulties that would have been fatal to an ordinary artiste. She also appeared in, conjunction with the late Catherine Hayes, and side by side with that popular cantatrice, in the opinion of those whose judgments had not been warped by certain prejudices, her vocal powers suffered no eclipse. It was in the concert room, however, where Madame Flower was most popular, and the "Old Arm Chair", "The Exile", "By the Sad Sea Waves", "Evangaline to Gabriel", and many other pieces will perhaps not again he heard to such perfection for many years to come as when sung by her whoso voice was so familiar to all classed of people in this colony, but which is now silent for ever. Madame Sara Flower had been a severe sufferer from rheumatism for the last few years, and it is to be regretted that providence was not made during health for the hour of sickness. Although an excellent teacher of music, she was too ill lately to earn more than a precarious livelihood, and her last hours were passed without those comforts and nourishments which could alone have proved beneficial. Her good nature was proverbial - she gave her services willingly for our public charities, and for the benefit of any brother or sister artist who sought them, and she was ever foremost to assist those of her profession who were in straitened circumstances. The funeral took place on the 21st ultimo, a solitary mourning coach containing the mourners. In early colonial days cultivation of the fine arts was regarded as less important than cultivation of the substantial products of the soil, and the gifted few whom an adverse fate cast upon these Australian shores half a century back found themselves and uncongenial surroundings. Still they made their presence felt, and did lasting good to the community. Among the early professors of the divine art of music none has left a name more lovingly remembered by all who knew her, or enjoyed the privilege of listening to her marvellous voice, than Madame Sara Flower, and it is a satisfaction to be able to present to the readers of the "Star" a copy of her likeness, transferred from an oil painting which has been kindly lent by its present possessor. This portrait was owned by Madame Flower at the time of her lamented deatlh in 1865, and was by her presented to the medical man - the late Dr. Duigan - who, out of friendship and pure goodness of heart, attended her in her last sad illness. The painting had been greatly damaged and cut about with a knife: in a drunken freak by the poor lady's husband. Dr. Duigan caused the picture to be repaired as far as was possible, and kept it till his death, when it passed into the hands of the late Mrs. J. B. Virdau, another old friend of Sara Flower's, and mother of the lady Mrs. Fremiln, from whom we have obtained it. It is due to Mr. J. W. R. Clarke, of Newtown, we should add, that the portrait has been brought under our notice, and a copy secured for publication. Mr. Clarke is son of another of the singer's old friends, the late Mr. J. R. Clarke, formerly so well known in Sydney as a music publisher, who was one of the select party of mourners who followed her remains to their old place of interment in Devonshire-street Cemetery. Mr. J. W. R. Clarke, in obedience to an impulse, which is probably inherited, is an active worker in the project which a few persons, have taken in hand to secure a fund for the erection of a suitable monument over the present grave of Sara Flower in the new cemetery at La Perouse. Madame, then Miss Sara, Flower first arrived in Sydney in April, 1850, and made her public appearance at a concert on the 3rd of May, when the music-loving portion of the diminutive city - professionals and amateurs alike - were fairly entranced by her grand voice and perfect execution. She had been trained at the Royal Academy of Music, London, and the capacity of her voice will be understood when it is said that it ranged over nearly three octaves, namely from D in the bass clef to C in alt. The cause of her leaving England was, we have been informed, of a domestic nature, and it certainly could not have arisen from lack of public patronage, as she was a great favourite on the concert platform, and with the single exception of Alboni, there was no contralto at the time capable of competing with her. England's loss, was Australia's gain, but the condition of current Sydney musical taste will be recognised when it is stated that the debut of this rare artist elicited from the leading paper of the day just half a dozen lines of perfunctory notice. Other singers of note, however, who could appreciate her splendid attainments, sought her acquaintance and found her, as accessible and affable as she was cultivated and capable. Among others was a lady vocalist of note, who is still happily a resident of Sydney, Mrs. Sheridan Moore, who at the time was well known under her maiden name of Miss Flora Harris. Mrs. Sheridan Moore had frequent appearances on the concert platform with Sara Flower, and with her practised the duet, "Hear Me, Norma," from Bellini's celebrated opera. She describes her as a great worker and enthusiast in her art. Madame Flower appeared on the lyric stage whenever opportunity offered, and also took part in dramas where songs could be suitably introduced. The stage of the old Victoria witnessed many of her triumphs in this direction. Her personal appearance was well adapted to set her off to advantage in character parts. She had a beautiful figure, limbs, and bust, and although her face was homely it became illumined as she entered into the spirit of her personation. Off the stage her hair was sand-coloured, without a trace of gold in it, and she had a colourless complexion. In 1854 when the Great Hall of the University was opened a musical festival extending over a week was held, and concerts were given on the morning and evening of each day. An oratorio, "The Messiah," was also produced. In all of these Madame Flower took a prominent part in conjunction with Mdme. Carandini and Mrs. Testar, a Melbourne vocalist of distinction, who was invited to Sydney for the celebration. The first occasion on which the writer of this article had the pleasure of hearing Sara Flower was in Melbourne during the early goldflelds racket. He had recently arrived from England, where his latest musical recollection was of Grisi, Mario, Didier, and Ronconi in the opera of "Lucretia Borgia." He learned that there was some decent singing to be heard in a big tent at the top of Bourke-street, known by the grand name of "The Salle de Valentino." He hied thither, and found himself taking a share in a promenade concert, wherein most of the audience seemed to think more of the promenade, the smoking, and the refreshment than of the proceedings on the stage. The singers, so far as he can recall, comprised Mdme. Carandini, some of the Howsons, Barlow of "Blue-tailed Fly" celebrity, and Mdme. Sara Flower. The whole performance was excellent, but when the contralto came on and sang "By the Sad Sea Waves", he forgot everything else - the big canvas tent, the tobacco fumes, the mixed-up audience disappeared, and the whole place became a heaven of music. How was it, he could not help thinking, that such a treasure was carolling forth at the Antipodes instead of delighting the denizens of the old world? The problem appeared to him to be inscrutable, and he must confess he has not solved it yet. The marked characteristic of Mdme. Flower's voice was that, it seemed to well forth of itself without effort or restraint. Then the clearness and elocution - a rare quality in a contralto - were perfect. Perhaps it might have been the unexpectedness of the treat, perhaps the peculiarity of the environment, but he certainly concluded that he had never heard better singing in his life, and subsequent experiences of the quality ot the singer hardly modified that conviction. There is something touching in the thought of this great artist finding an early end to her career amidst miserable surroundings, in a land which must have been to her exile; in her almost neglected burial in a cemetery which has ceased to be a place of consecration, and is about to be the scene of turmoil and uproar as a railway station; in the removal of her poor bones from their resting place and their transference to a more remote spot, where, let us hope, the development of traffic may no more intrude on their privacy. Such a brilliant prospect as must once have invited her, such a career, with its melancholy termination, and such unrest even for her mortal remains, must surely appeal to the sympathies of this generation to see that fitting tribute to her powers is paid at the spot which marks her latest grave. It Is not much that is needed, only such modest memorial as will perpetuate her name and the excellence of her art. Her successors on the stage and the platform might well take a prominent part in seeing that this much is accomplished, and with their initiative there are sufficient lovers of good music among the outer public to ensure a successful issue to the undertaking. "Sacred to the memory of Sara Elizabeth Flower, third daughter of the late William Lewis Flower, of Grays, Essex, England, who died the 20th of August, 1865, aged 43 years. May she rest in peace. The great contralto of her day." Strong iron railings surround the monument. Mr. Clarke, whose labours have been crowned with such success, is an Anglican. His father was once one of the leading booksellers and music publishers of Sydney, and was the friend of Madame Sara Elizabeth Flower, Lucy Escott, Catherine Hayes, Madame Anna Bishop, the Carandinis, Rosalie Durand, the brothers Lyster, Squires, Farquarsoh, Armes Beaumont, G. V. Brooke, Kitts, Kean, Booth, and almost every other celebrated artist who visited our shores. A significant number of London and colonial song editions advertised that they were sung by Sara Flower. "The concert given by the Messrs. Marsh last night at the Victoria Theatre was most successful. The great interest of the evening was the début of Miss Sara Flower, of whom much was expected, and contrary to what usually occurs in such cases the expectations were fully realised. Miss Flower's voice is of great compass and power, rich in tone, and her enunciation most distinct." The fact is that so perfect a voice of the quality has not to this day been heard in Australia, not one better cultivated. The contralto parts taken by her in opera here have never been equalled musically, and as a proof of the extraordinary range of her voice, as well as her ability in lyric drama, it need only be mentioned that she was the first Norma in Australia. Two characters in which she afterwards appeared - Azucena in Trovatore, and Maffeo Orsini in Lucrezia Borgia - have not been equalled by any other artiste in Australia; though a splendid acting representation of the former was once given in Melbourne by Lucy Escott, who declared that she would not attempt the part again. Sara Flower married Mr. Sam. Howard, actor and manager, never returned to England, which probably accounts for the omission of her name in Grove's Musical Dictionary, and after a somewhat chequered career died about twenty years ago, in comparatively poor circumstances, in a cottage in Victoria-street, Darlinghurst.